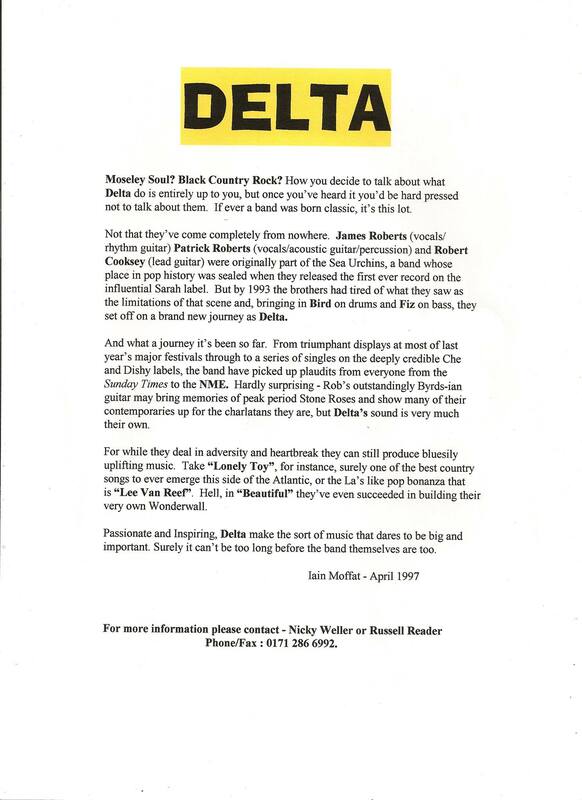 The brilliant and much missed Delta. Press/label release. Via Mike Davies. 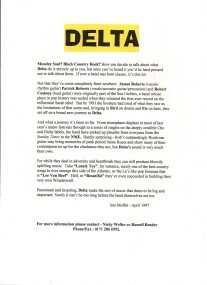 This Moseley, Birmingham, England-based band remains one of the best kept secrets on the UK independent music scene. 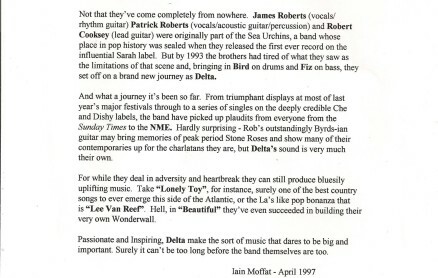 Delta was formed in 1993 by James Roberts (b. 4 March 1970, West Bromwich, West Midlands, England; guitar/vocals), Patrick Roberts (b. 1972, West Midlands, England; drums/vocals) and Robert Cooksey (b. 14 November 1969, Solihull, West Midlands, England; guitar), who had previously played together in cult indie band the Sea Urchins. Adding Bird (b. 1972, England; drums) and John Alford (b. 1977, England; bass), they debuted with the 10-inch single ‘Sugared-Up’ on the Che label. Three singles for Dishy Records followed before the band signed to the Acid Jazz Records subsidiary Focus. This move effectively put the band’s career on hold for almost five years, with no material being released. They eventually broke free of the contract, returning to early supporters Dishy. Laughing Mostly, a compilation of EP tracks and demos recorded between 1994 and 1997, finally saw the light of day in 1999. Cooksey was subsequently replaced by keyboard player Louis J. Clark, the son of noted arranger Louis Clark who collaborated with Jeff Lynne on most of ELO’s albums. The band’s debut album proper, Slippin’ Out, was recorded at UB40’s studios and utilised horns and a string section to augment the Roberts brothers’ classic pop songs. The follow-up was originally slated for release on a major label, but the band’s run of bad luck continued when they were dropped following a management reshuffle. Hard Light was eventually released on the band’s own label.